The ST-2052 terminal for reading the eGK (electronic health card) and KVK (health insurance card) is the clever alternative for all price-conscious users in the lead-up to the launch of the connectors. When the connectors are released, the terminal will become a little all-rounder, which can be used conveniently for electronic signatures or home banking. The USB chipcard reader can be operated easily with one hand due to its sturdy weight and stable stand. Please note that the device must be approved by the manufacturer of the practice administration program or hospital information system in order to use the entire scope of functions. For more information contact the manufacturer of the software in use in your practice directly. The multi-functional card terminal is suitable for stationary and mobile use. Ease of operation and problem-free compatibility with all standard software programs make the battery-powered ST-1530 a delight to use, and it can also be easily integrated into any existing EDP system. The extremely compact mobile terminal is the first of its type to feature a high-definition colour display, and when used with a USB adapter, it is also suitable for use as a table-top device. Are you looking for a completely reliable terminal for the new electronic health card? Then this device is a must. Easy to operate, completely reliable and rapid data transmission make the network-enabled ST-1503 standard in its class. It can also be upgraded, enabling you to work with the device way into the future. The ST-1503 also features economic power consumption with the On/Off switch not found on every terminal. Are you looking for a keyboard for the future electronic health card? Then this device is a must. Its user-friendliness and complete reliability ensure the space-saving G87-1504 is unique in its class. It can also be upgraded, enabling you to work with the device for a long time to come. Using the Cherry Translating proxy driver, the connector can also access the USB G87-1504 keyboard via LAN. As a biometrics specialist, Bromba provides consulting services as well as software and hardware components for industrial, trading, and public customers. Based on patented algorithms, Bromba develops and offers fingerprint technology with outstanding performance, especially suited to the challenges of low-cost fingerprint sensors. 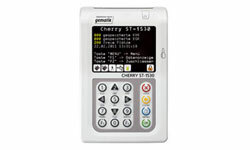 There is a close cooperation with Cherry in the area of development and software support for biometric devices.